la scelta dei fan: these shoes ? Stephen Voiced the cat - did he do a good job? Is he your preferito Alice in Wonderland character? la scelta dei fan: Yep!! Do te have a cat? la scelta dei fan: Yes, but he/she dosen't look like Cheshire. Do te like your Chessur chubby & cuddly,super skinny,or in between? why can the cheshire cat dissapeare? Inspired da the crafty cat that bemuses Alice, this cupcake is all grins — and likely to disappear in the blink of an eye. He is a mysterious blue cat. He is fond of pranks and tricks, and has the ability to disappear and reappear at will. He befriends Alice when she shows up in Wonderland. The Cheshire Cat is a fictional cat popularized da Lewis Carroll's depiction of it in Alice's Adventures in Wonderland. 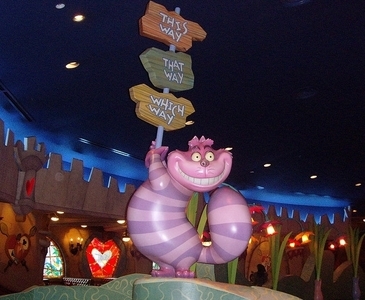 In which Disneyland can te see this figure of Cheshire Cat? Hey! Let's start a Cheshire Cat ROLEPLAY! !